Jagged cliffs drop away to lush tracts of parkland that extends along much of Blacks Beach. Native vegetation and shaded walkways wind their way between stands of Casuarina and the general feel is one of quiet, contented comfort. This is a small, family-oriented community so the natural recreational focus tends to be fixed firmly on the beach and water sports. Stretching 6km, Blacks Beach is the area's longest continuous beach and at times it seems you can have it all to yourself! This is a great fishing spot where bream and whiting are regularly hooked. 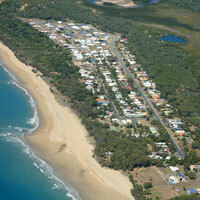 For the angler's cook-up, picnic facilities, BBQs, toilets and a playground can be found at Blacks Beach Park.